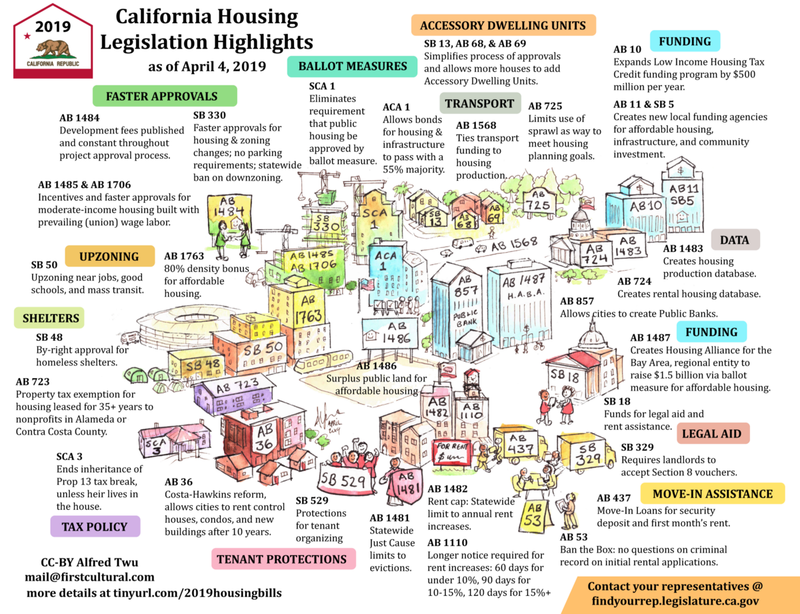 There are something like 200 bills covering housing in one form or another in the current legislative session in California. Scott Wiener’s S.B. 50 has gotten attention because it proposes some really bold moves and has both strong support and strong opposition. But there are a lot of other bills that propose some way to fix the housing crisis, covering everything from zoning to the approval process to tenant protections to funding to accessory dwelling units to homeless shelters and beyond. Luckily, Alfred Twu, a designer who lives in Berkeley and spends time thinking about planning and architecture, has created a visual guide to some of the main housing bills. This is the same Alfred Twu who created a game about replacing the parking lot at the North Berkeley BART station. He also recently wrote and illustrated an enlightening primer on the history of sloped vs. flat roof shapes that is a must-read. Twu includes a brief description of each of the bills he describes–although not of every last housing bill on the docket. Many cover similar territory, and as the legislative session winds through its course, they will change. So think of this as a snapshot of what the state is thinking about now, accompanied by Twu’s charming watercolor illustrations. Above is a small version of the graphic; click on it to expand. You can download a large version here. And Twu urges you to call or email your representative to let them know what you think.